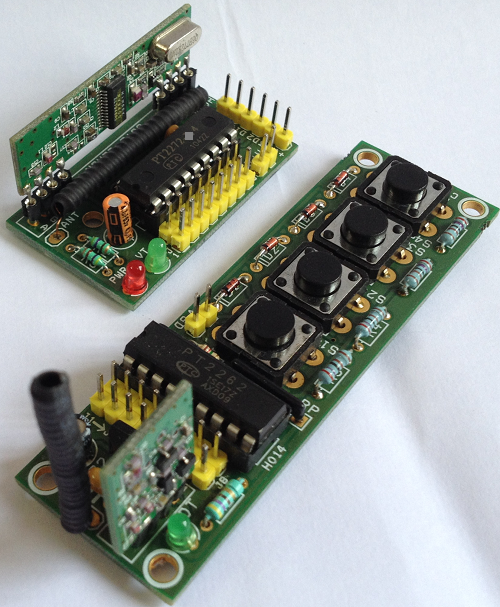 4 Channel RF remote built using PT2262 and PT2272-M4 IC from Princeton technology. 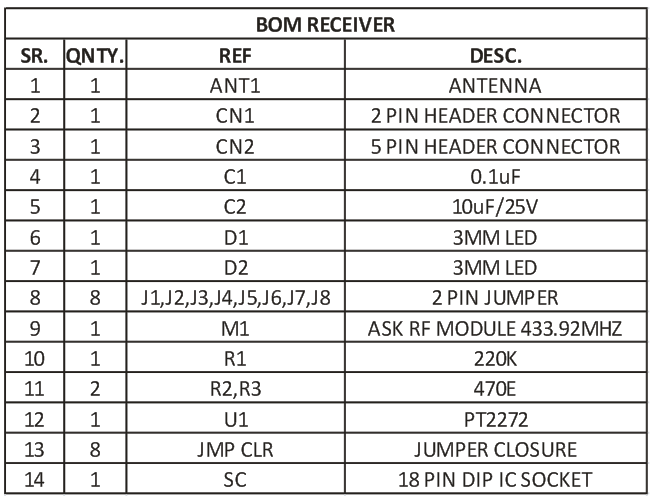 PT2262 used as Encoder (Transmitter) and PT2272-M4 Decoder (Receiver) ICs are heart of the project. 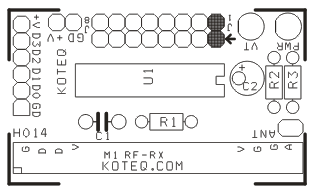 The receiver provides 4 channel Momentary outputs. 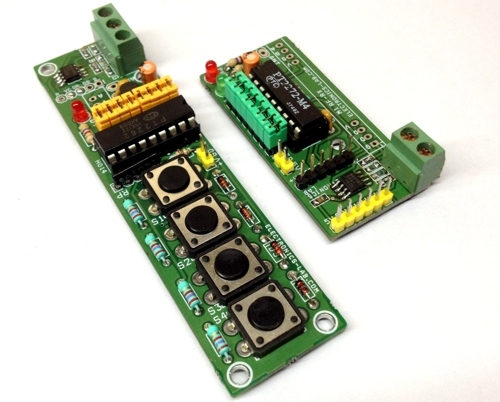 All outputs are TTL level can be interface with other circuits or relay board. 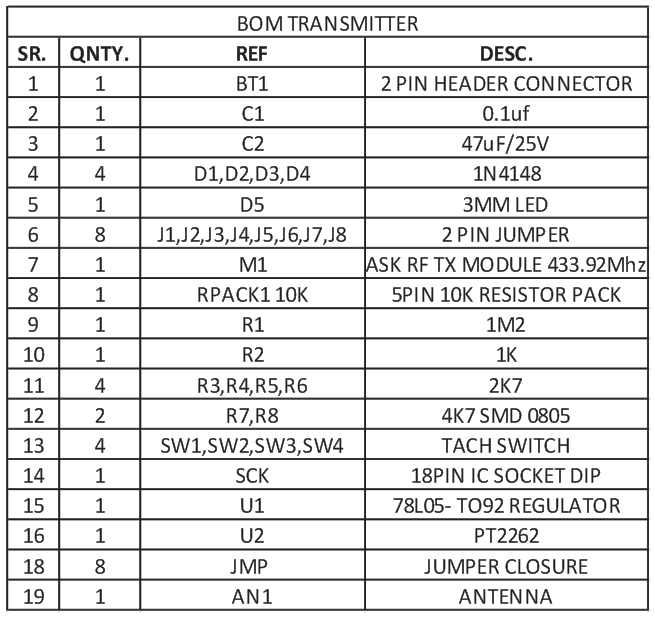 Transmitter works with 5V to 12V DC. 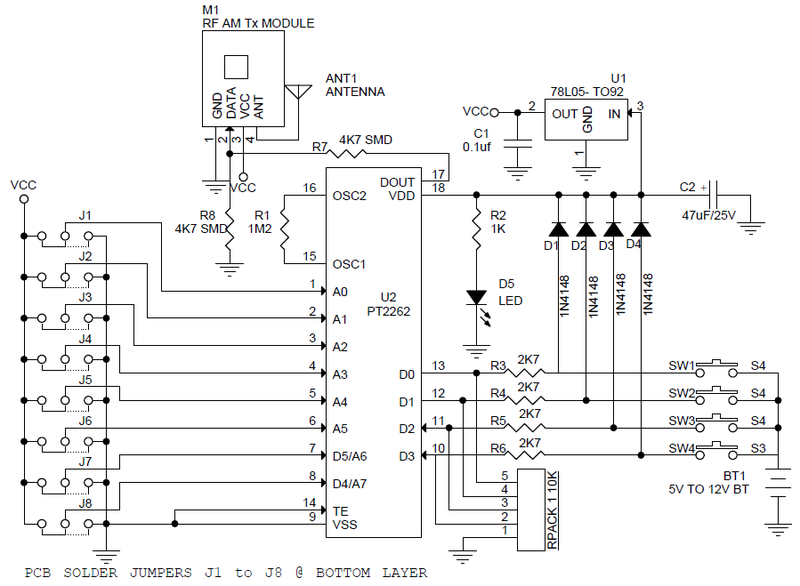 Receiver works with 5V DC. 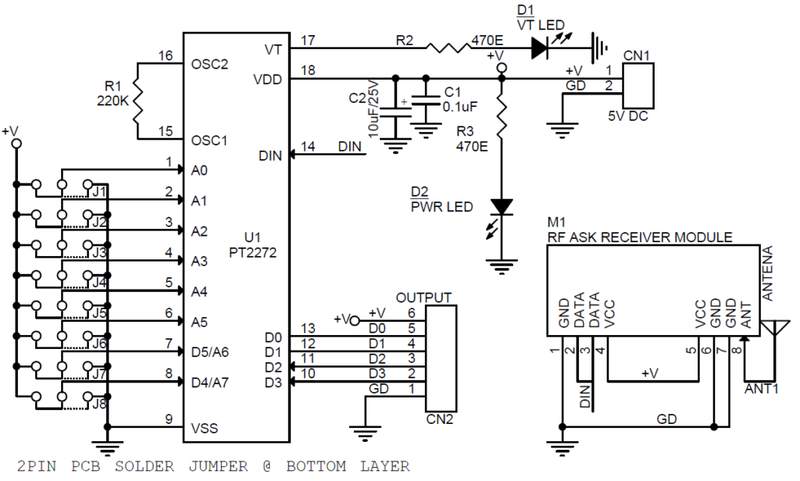 PT2262 is a remote control encoder paired with PT2272 utilizing CMOS technology. 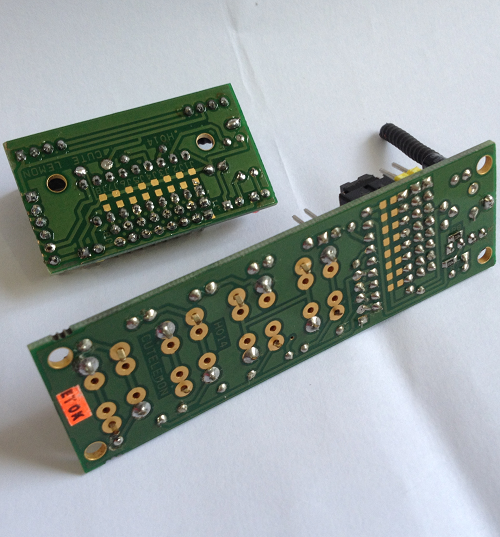 Its encode data and address pins into a serial coded waveform suitable for RF modulation. 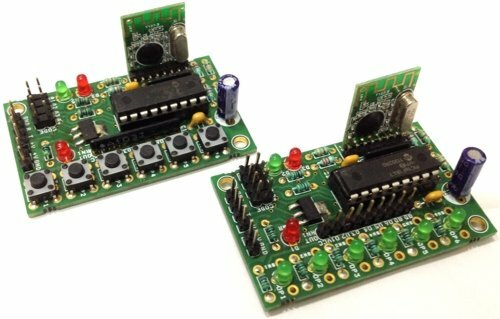 Circuit uses 8 bits of tri-state address pins providing up to 6561 address codes, thereby, drastically reducing any code collision and unauthorized code scanning possibilities. PT2262 encodes the code address and data set into special waveform and outputs it to the DOUT when TE is pulled to low. 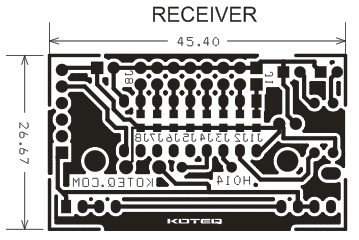 The wave is fed to RF modulator (ASK RF TX Module) for transmission. The transmitted radio frequency is received by RF demodulator (ASK RF RX Module) and reshaped to special waveform. PT2272 is then used to decode the waveform and set the corresponding output pins. Thus completing a remote control encoding and decoding function. When PT2272 receive a transmission code word, it initially checks weather this is a valid transmission. For a transmission to be valid, (1) it must be complete code word, and (2) the address bits must match the address setting at the address pins. After two consecutive valid transmission, PT2272 (1) drives the data pins according to the data bits received, and (2) raises VT to high state. 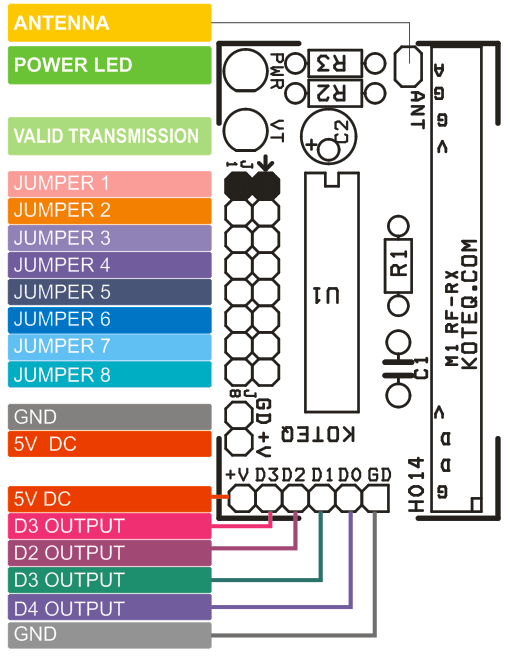 NOTE : Jumper J1 to J8, To set High Jumper provided at Bottom layer of PCB, Jumpers and closure provide to set low, don’t use any of these for floating. 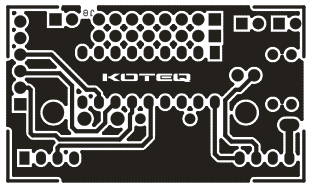 Did you design the PCB on eagle?If yes could you post the modules here? This project isn’t designed in Eagle and i have not the source files on hand. Are Gerber files helpful? 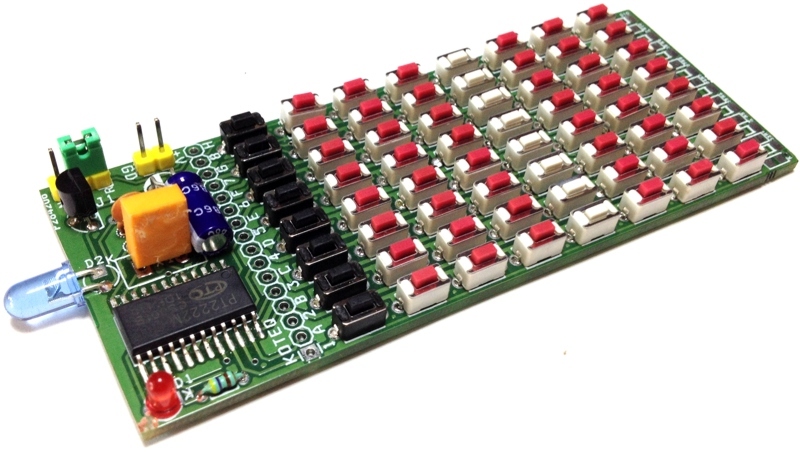 Where are R7 and R8 on the PCB layout ? They are underside so they are not visible on the PCB image. You can notice them on the last photo on the right. 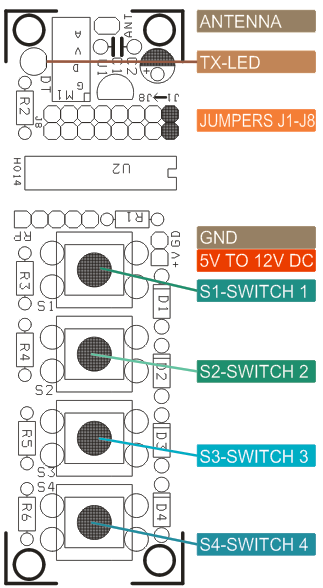 Ok. Can i use normal 4.7 K resistor instead ? Yes, normal resistors will work fine.